1. Before man figured out how to craft glass, nature was already making it. When lightning strikes sand, the heat sometimes fuses the sand into long, slender glass tubes called fulgurites. The intense heat of a volcanic eruption sometimes fuses rocks and sand into a glass called obsidian. In early times, people shaped obsidian into knives, arrowheads, jewelry, and money. 2. Around 3,000 B.C. is when we find the first real evidence of manufactured glass by people. The Mesopotamia, Egypt, Syria were hubs of glassmaking. But you can thank an ancient Roman for the fact for glass in your everyday life. Because of their empire-making ways, Romans spread a more modern glass manufacturing knowledge to its newly conquered lands. 3. One of the most valuable glass art objects in the world is the Portland vase (pictured in this post), which was probably made in Rome about the beginning of the Christian Era, between AD 5 and AD 25. 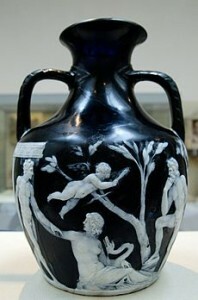 The Portland Vase, made between AD 5 and AD 25. 4. The first the glass plant built in the United States was at Jamestown, Virginia, in 1608. 5. In the 1850s, bottles and flasks were first used mainly for whiskey. 6. The screw-top Mason jar for home canning appeared in 1858. 7. Ordinary glass turns brown when exposed to nuclear radiation, so glass companies developed a special non-browning glass for use in observation windows in nuclear power plants. 8. Glass containers can be recycled—that is, broken up and then melted with silica sand, limestone, and soda ash to make glass for new containers. Glass can be recycled easily because it does not deteriorate with use or age. 9. The energy from recycling one glass bottle can power a computer for 30 minutes. 10. In the US today, about 80% of glass containers are recycled, compared with less than 25% of plastic containers. 11. By the end of 2013, glass manufacturers plan to use 50% recycled material in the production of new glass bottles. This step will save enough energy to power 45,000 households for a year, and 181,550 tons of waste from landfills each month. 12. Glass has the quickest turnaround of any curbside product, back on store shelves in as little as 30 days. 13. Glass can be recycled indefinitely and not lose its quality. 14. The glass container industry is worth US$5.5 billion dollars. 15. Recycled glass, also called cullet, requires a lower heating temperature than glass from raw materials, thus requiring 40 percent less energy. 16. Brown glass is used most often for food or drink containers, especially beer, because the amber tint reflects ultraviolet light and protects against spoilage. 17. In January of 2008, North Carolina became the first state to mandate that bars must recycle glass containers. 18. Making glass is like following a simple recipe of ingredients. The first 3 ingredients are in all glass: sand, soda ash and limestone, the fourth ingredient is the addition of chemicals to give glass their color.